This post explains about how to send email in ASP.NET. Sending mail from ASP.NET is not complex, per se. But, it might take a while to figure out since we normally don't set it up often. If you're using Web Hosting, typically web hosting company already set up the mail server, so all you need is to create mail account and use it. 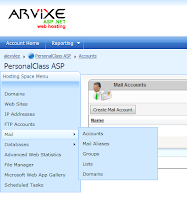 I am using Arvixe ASP.NET web hosting so I will show you how to send email by using Arvixe SMTP mail server. 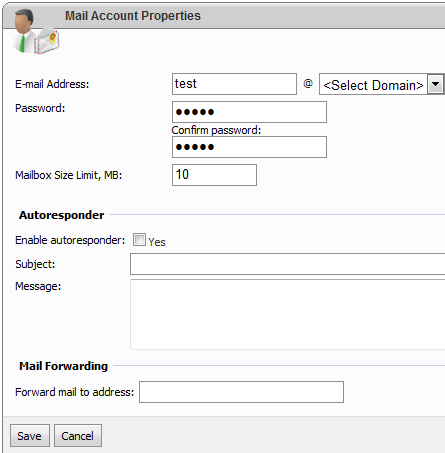 Log in to Control Panel and select Mail -> Accounts and create new email account. 2) Once SMTP email account is created, you can send email in ASP.NET with the following code. Let's say your domain is TEST.COM; in that case your mail server will be mail.test.com in Arvixe. 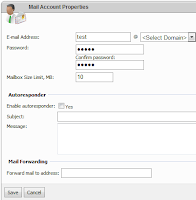 In your ASP code-behind or any business class, you create MailMessage which includes From/To/Subject and Body message and send it to SMTP mail server through SMTP port 25. You have to specify your mail server (mail.test.com) in SmtpClient constructor and since your SMTP server requires authentication, you also have to provide Credential. You can use your mail account information in credential username (admin@test.com in this example) and its password. If SMTP server requires credential but you don't specify username and password, the following exception will occur. The SMTP server requires a secure connection or the client was not authenticated. The server response was: SMTP authentication is required. 3) The above code snippet will work but server name and user/password info are hardcoded. Not a good way. In ASP.NET, we can move those information to web.config as follows. And then C# code can be simplified like this. As you can see, you do not specify mail server name and port number. And credential information can come from web.config file. 4) Now, you can check your email. 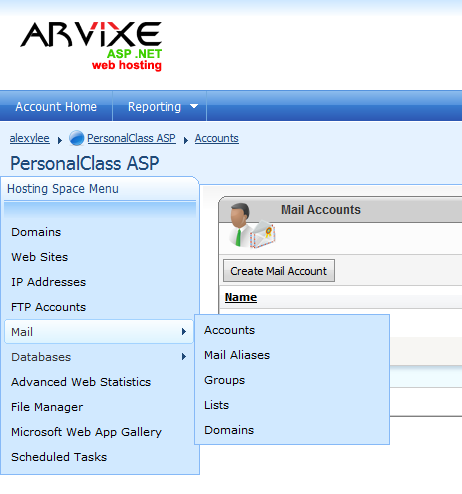 In our example, you are supposed to check your email from http://mail.test.com (in Arvixe case), assuming the domain is test.com. nice article. if you are maintaining any template for email.. this may help you. Ga3far, this error is connection error. Somehow you cannot reach your SMTP server(***.***.**.***:25). The reason can vary. Please check to see smtp service is running and port 25 is open. You can try to connect with TELNET. Please also check your IP address is not local IP address (ie, use external DNS name). It is gmail server that put your email into spam folder. Based on their criteria, gmail can consider your mail as spam. Please copy any of your Inbox mail content (valid, more complex content) to msg.Body and give it a try. This is not controlled by C# code. Just addition for you, this blog provide almost provide same tutorial about how to send email in asp.net. Hope this help. Hi.. Thanks for sharing.. I also have a reference on how to send email in asp.net . may be useful . This is nice post , thanks for sharing...! • Over 3 MILLION websites being hosted worldwide. • 93% of users say they would recommend Arvixe.